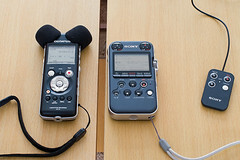 This review will compare the merits of the Sony PCM-M10 against the Olympus LS-10 and LS-11 portable audio recorders. All three are excellent units that will suit those who want a hand-held recorder with the convenience of built-in mics and very good pre-amps. If you never plan on using external mics, there are cheaper options. If you require phantom power for professional microphones, there are larger and more expensive units. For details of these options see my previous articles, starting here. But otherwise it is these three models I have chosen to investigate further, on the basis of my previous evaluation.